Offer valid for performances thru 6/30/19. Blackout dates may apply. Not all seats are discounted. Prices include a $2.25 facility fee. All sales are final — no refunds or exchanges. Offer subject to availability and prior sale. Not valid in combination with any other offers or for previously purchased tickets. Normal service charges apply to phone and internet orders. Cast and Performance schedule subject to change. Offer may be revoked or modified at any time without notice. Limit 10 tickets per order. A unique new musical highlighting Oscar Hammerstein’s journey to become Broadway’s greatest lyricist. 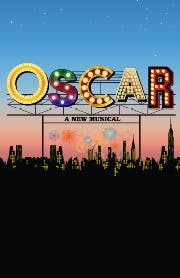 The musical explores Oscar’s life in his words while showcasing over 30 of his greatest songs from shows like The Sound of Music, Show Boat, Oklahoma!, Carousel, South Pacific, Allegro and more. Utilizing state-of-the-art 3D holographic technology called IceMagic, the imagery is often referred to as a hologram. The visual effect is created through a specialized projection system and it is the first time this holographic technology will be implemented on the Off Broadway stage. Whether your musical palette drives you toward graceful vocals, engaging theatricality or captivating storytelling, there’s a strong and powerful fusion of all three in “SINCERELY, OSCAR”. We all know what words Oscar Hammerstein wrote…......We now learn WHY he wrote them in the must-see, new musical!